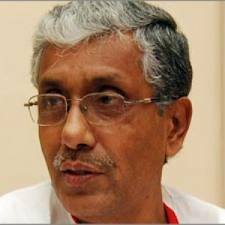 Agartala, Mar 7 : Mr Manik Sarkar was today sworn in by Governor D Y Patil for a fourth straight term as Chief Minister to head the fifth consecutive Left Front government in Tripura along with 11 ministers. The other ministers who took the oath of office and secrecy at the Raj Bhavan were Aghore Debbarma, Badal Chowdhury, Tapan Chakraborty, Manik De, Jitendra Chowdhury, Khagendra Jamatiya, Manindra Reang, Bijita Nath, Shahid Chowdhury, Bhanu Lal Saha and Ratan Bhowmick. Saha, who was the deputy speaker and Bhowmick, were the two new faces in the ministry. Information and Higher Education minister in the earlier government, Anil Sarkar, who was elected uninterruptedly since Tripura was declared a full fledged state in 1972, was dropped this time because he will be made the vice-president of the planning department of the state. CPI-M Politburo members Sitaram Yechury and Surjya Kanta Mishra, who is also the Leader of the Opposition in West Bengal were present at the swearing-in ceremony. The chief minister told reporters later that the portfolios will be distributed after a meeting of the council of ministers tonight. Congratulating the people for the victory of the Left Front, Sarkar said, “There will be no wall between the people and the government. “The Left Front government will be a people's government,” he said, adding he expected cooperation from the Opposition.